Volcanoes are pretty amazing when you think about them. I have started thinking about them a lot more since I wrote about one in one of my stories. Here are some things about volcanoes that you might find interesting. 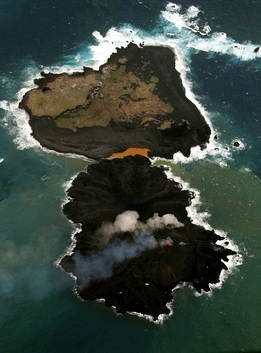 A real life island formed by volcanoes! 'Snoopy Island' is actually started as two separate islands - Nishino Shima and Niijima. This island was nicknamed 'Snoopy Island' because it looks a little like a cartoon dog named Snoopy from a comic strip called 'Peanuts' by Charles M. Shultz. Snoopy is not this Japanese island's official name. The orange brownish colour you can see where snoopy's collar is is actually a narrow pool of seawater. What do you think? Do you see a resemblance between the island and snoopy? To the left is a photo of a volcano in Antarctica, it is called Mount Erebus. Mount Erebus is not the only volcano in Antarctica. Mount Erebus is special because it is one of the few volcanoes in the world that has a permanent lake of molten lava in its crater! I think it is pretty amazing to see a volcano filled with a lake of lava covered in snow! Pumice or Pumice stone is a unique volcanic rock. Pumice is pretty interesting, it's the only rock I can think of that floats! But, that is not the only reason I like pumice stone, another reason I like it is because I use it to scrub my feet with when I have a shower. I read that earth is not the only planet in our solar system that has volcanoes - apparently there are volcanoes in space!!!! !